Classy Event Organizer: WTF: What, the Fork?! Do you remember that scene in Pretty Woman where Julia Roberts sits with the hotel manager and learns about table manners? She is taught how to take the dinner napkin and lay it gently in the lap. She looks at the table setting as if she’s never sat at a table to eat before in her life. Her reaction to the to lesson (like many peoples’) was: “I definitely have the salad fork, but the rest of the silverware is…. confusing.” Now, for those of us who know how to use the assortment of forks at a formal dinner table this scene is rather humorous. It brought me back to a time when I was trying to learn the tricks of which fork to eat the salad with. Yes, that three or four pronged thing usually to the left of your dinner plate has an extremely long and boring history (trust me, I read it). In most etiquette and party planning books there are chapters on table settings and flatware (except flatware isn’t actually flat) as well as, where and how the many forks are used. Without getting too deep into the history of the often overlooked, pronged eating utensil, (did you know that the earliest mention of a fork is from ancient Greece and is mentioned in the Hebrew Bible?) I would like to share an easy explanation of the three most important forks that you might see at a fancy restaurant. Even if you don’t normally set your table this way, if you are entertaining someone out on the town, you wouldn’t want to look foolish by using the wrong fork would you? Didn’t think so. Salad Fork: The salad fork is usually a four pronged fork is used at during the salad course of a mean (most of the time this is the first course). It can double as a fish fork or even a luncheon fork. This fork is placed to the left of the plate, the outer most fork. Dinner Fork: The dinner fork is a four pronged fork used during the main dinner course of the meal. 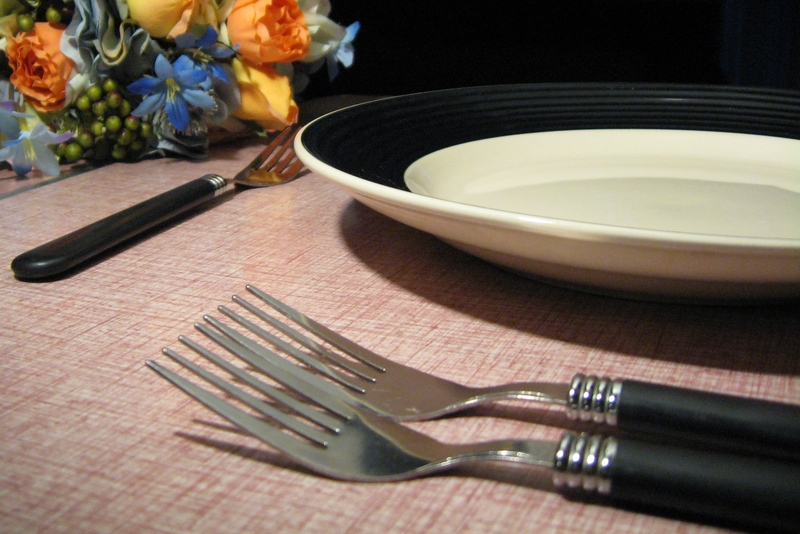 It is the largest fork in the set and is placed to the left of the plate, but to the right of the salad fork. Dessert Fork: The dessert fork is a four pronged fork (an usually looks like salad fork) and is used during the dessert course of a meal (my favorite!). This fork is normally served with the dessert course and used to eat dessert that cannot be eaten with a spoon. If it is placed at the table setting during the dinner meal, it would be placed at the top of the plate with the prongs facing to the right . If you ever get confused (which you might on occasion) just remember that a table is set according to the use of the flatware, use the outer most fork first!